It will be here sooner than we think — the extreme cold, snow, and ice that mark the beginning of the winter driving season. Conditions can change quickly in the winter. Being prepared for what Mother Nature throws at us can make the difference when it comes to safe travel. Use this training blueprint to aid in making your training more cost-effective, memorable, objectively evaluated, and efficient in use of time. Trainer’s Note: You may want to consider the use of a video to introduce your session. When selecting a video, consider your drivers’ experience, the type(s) of vehicle(s) they operate, and the conditions they deal with during the winter driving season. The heater and defroster are working properly. All exhaust system connections are secure. A loose connection could cause carbon monoxide to leak into the vehicle. The cooling system is full and there is enough antifreeze. An antifreeze that is good to -25°F is recommended. The battery is fully charged. Cables should be firmly connected and not corroded. All lights are working properly and clear of snow, ice, and dirt. Wiper blades press against the windshield hard enough to wipe it clean. There should be plenty of washer fluid (that can be used in cold temperatures) in the reservoir. Carry the proper size and number of chains and extra links. Regularly check the chains for broken hooks, worn or broken links, or bent or broken side chains. Know how to safely put chains on a vehicle’s tires. Not wait until the last minute to put the chains on a vehicle’s tires. The driver should pull over in a safe and level area, preferably a designated chain-up area. He/she should also wear reflective clothing to remain visible to other drivers. Chains should be snug, but not too tight. They should be regularly checked and retightened when necessary. Trainer’s Note: Tire chain requirements vary from state-to-state. Review the specific requirements for the state(s) in which your drivers travel. Warning devices, jumper cables, a flashlight, a tool box, and a first aid kit are supplies the driver should carry in the vehicle. During the winter months, a snow brush and scraper, a small shovel, and some form of traction devices (chains, sand, etc.) should also be in the vehicle. The vehicle should be stocked with extra food and water, blankets, medicine (as needed), and proper outerwear (e.g., hat, gloves, boots, heavy jacket). The No. 1 rule for a driver who is stranded — stay in the vehicle! A stranded driver should put on his/her extra clothing to stay warm and use his/her food and beverage supply cautiously. Depending on road and weather conditions, the driver could be stranded for a while. The driver should only run the vehicle’s engine if he/she is certain the exhaust pipe is free of snow. If the vehicle is running, a window should be left open a crack to prevent carbon monoxide poisoning. 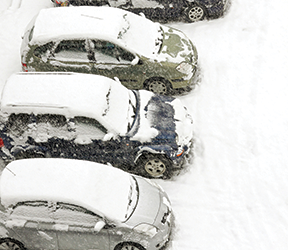 Rapidly changing weather and road conditions pose several challenges during the winter months. The following are a few guidelines drivers should follow when on the road during hazardous winter weather. Check on road conditions before beginning the day, and then throughout the day (when it’s safe to do so). Turn on the vehicle’s low beam headlights to increase visibility. on ice, reduce vehicle speed by about two-thirds. Allow for additional following distance. It takes longer to brake safely on a snow-covered and/or ice-covered road. Do not use cruise control. Even a short tap on the brakes to deactivate the cruise control feature can cause a loss of vehicle control. If it’s too dangerous to continue, pull off in a safe area (truck stop, rest stop, etc.) until conditions improve and it is safe to continue. Black ice forms when temperatures drop rapidly and hover around the freezing mark. Any moisture on the road freezes into a smooth, nearly invisible, slippery surface. Most drivers aren’t aware of black ice until it is too late, making it one of the more dangerous road conditions that a driver faces. On cold days, when the road is wet, extra attention should be paid to the spray thrown from other vehicles. If the spray suddenly stops, black ice may be forming. Bridges, shaded areas, beneath underpasses, the lower side of banked curves, and dips in the road are the most common places for black ice to form. Because they remove snow and apply sand, salt, or other road treatment, snowplows travel at a slower rate of speed than other vehicles. A safe following distance of at least five to six car lengths behind a snowplow should be maintained. A driver should never drive next to a snowplow. A plow can shift sideways after hitting a snowpack or drift. Also, a driver should never drive through white-out conditions caused by swirling snow around a snowplow. If passing a snowplow is necessary, it should be done in a safe and legal passing area that is clear of snow and ice. Drivers should ensure there is enough clearance to the side, as plows are wider than most vehicles and portions of the plow and blade may not be visible due to blowing snow. Trainer’s Note: Distribute and review any policies your company may have that address this issue. Conclude your training with a question and answer session. This article was featured in the Transportation Safety Training Newsletter Newsletter. The Transportation Safety Training Newsletter Keeps you current on critical training and transportation-related issues to build your drivers' skill level, reduce the chance of fines, and stay in compliance. Click here to sample this newsletter for free or view our full library of transportation compliance publications.